2010, Dir. by Nimrod Antal. I'm not sure there's an action movie that male viewers of the last 25 years love more than Predator. The jungle-based sci-fi blockbuster starring Arnold Schwarzenegger has held up extraordinarily well, and also holds the distinction of being one of the few genre films of the late '80s that didn't spawn a series that was based around its star(s). While Terminator/Die Hard/Lethal Weapon/Aliens flicks continued to occur with original cast members, John McTiernan's original Predator - despite the fact it did have an Arnold-free sequel and the two AVP films cashing in off of it, has always remained its own entity. While others could argue their favorite film in each of those other franchises, I don't know if I've ever met anyone who proclaims something other than Predator as their favorite dreadlocked alien hunter film. 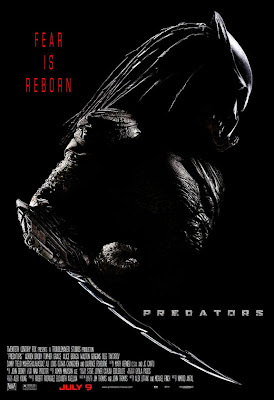 I don't think that's going to change with the release of the Robert Rodriguez production of Predators - though I imagine the youngsters who only know Arnie as a governor might disagree - but I'm actually kind of shocked at how pleased I am with Predators after an initial viewing. This "rebirth" of the franchise, which only briefly refers to the events of the 1987 film, manages to dive into some fresh ideas while maintaining a strong connection to its original source. Another fine touch is the film's musical score. Original music for the film is credited to John Debney, but I didn't find much in the film that wasn't taken directly from Alan Silvestri's score for the original Predator. That's not a bad thing, as this has always been one of my favorite soundtracks for any action film, and it helped remind me of the connection to the original film...and even seemed like a genuinely respectful gesture. I think that was the most exciting thing about Predators for me. The movie offered an entirely new set of characters (I thought Adrien Brody was a fine lead, if anyone is wondering) and an entirely new world, but still felt like it really respected the film it was following. Though it would have been easy to assume audiences don't remember what happened 23 years ago (and many studios/producers assume far less of audiences), Rodriguez and director Nimrod Antal manage to avoid short-changing the viewer. They don't do this by simply mimicking Predator either, as a couple of iconic one-liners from that film are left out of this version entirely. A few of the twists this story takes in regard to its characters and predators aren't completely effective, but I admire the film for not taking the easy route. It would have been cheaper for Fox to send us Alien vs. Predator 3: The Quest for More Money, but respect for the viewer somehow won the day. It's a rare victory for us, so I most definitely plan to enjoy it while I can. You should too. Sound like an interesting movie. I don't expect "Predators" to be the next great thing, but as long as it's a step up from that "AVP" crap, I'm gonna take whatever I can get. I can't wait to see this. Sounds like a lot of fun and the perfect remedy for the crap that's being shown in theaters this summer. I've been SO excited for this, but also a bit nervous after the AVP fiascos. So glad to hear it's going to be worth the wait. Yay, Predators! 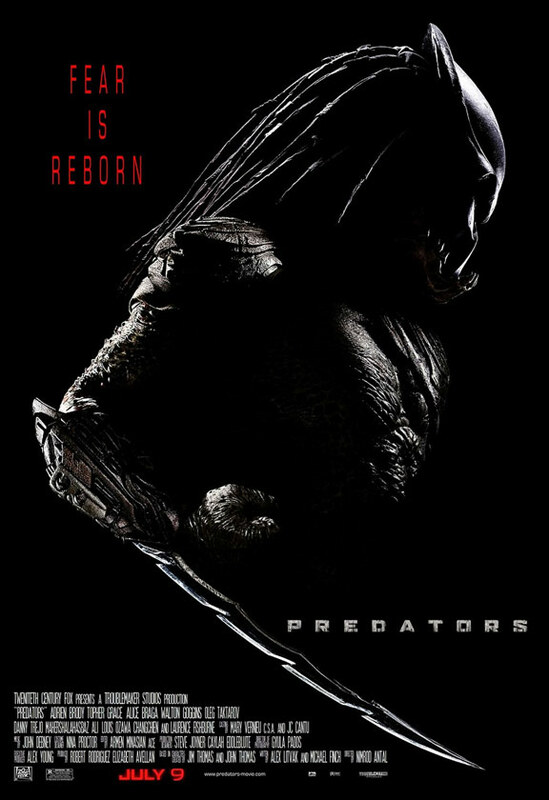 It's a pity that the Predators didn't have more time on screen especially as the film is named after them. I was disappointed. The Danny Trejo and Laurence Fishburne cameos had more time and those were pretty much phoned in. One day Topher Grace might not end up cast against type either. Typical summer movie though.